The US is not present in South Asia for peace and stability but to create chaos in the region, Pakistan's former Foreign Minister Hina Rabbani Khar has said. "As George Friedman states in his book 'The Next 100 Years', the US is present there to create chaos in the region so that Russia, China, Iran and other regional countries can be contained," Khar told CNN in an interview.While discussing the New Year tweet of US President Donald Trump, Khar said that if she was in Foreign Office, she would have "ignored the tweet" and be "more concerned about tweeter than the tweet". Pakistan is still reeling from the after-effects of Trump's first tweet of 2018 in which he announced cutting all further aid to Islamabad on charges of harbouring terrorists.In the tweet, Trump said "the US had foolishly given Pakistan over $33 billion in aid over the last 15 years" and accused Pakistan of thinking "US leaders to be fools". "They give safe havens to the terrorists we hunt in Afghanistan, with little help. No more!" he said. 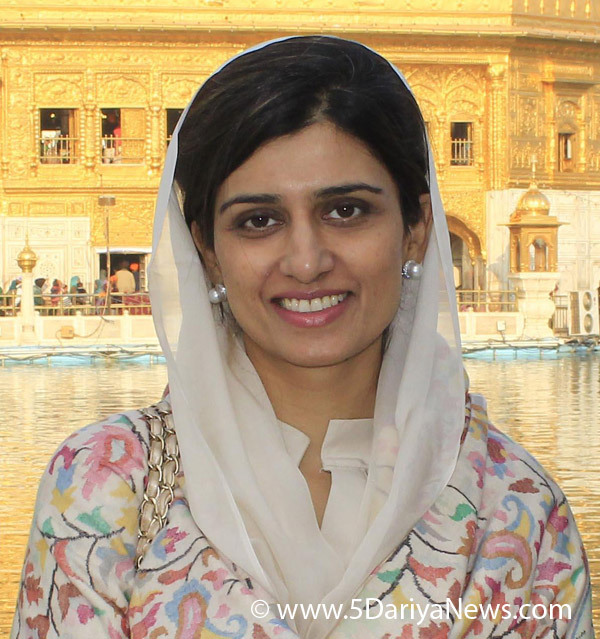 Asked what was her reaction after the aid cut announcement, Khar said: "The US is currently the superpower, but if you're going to tweet away your foreign policy, then clearly frankly if I was in the Foreign Office of Pakistan, I would totally ignore this tweet. ""This person is a habitual tweeter who tweets rather flippantly, almost like which side of the bed you woke up on. After all the other tweets, I think we should be more concerned about the tweeter than the tweet," she said.Khar said that Trump's belief about Pakistan's dependence on US aid was "exaggerated", the Nation daily reported citing CNN. "I don't think we're dependent on it at all. As someone who managed Pakistan's portfolios for almost five years, I can tell you that our reliance on them is vastly exaggerated." Taking a jibe at Trump, Khar said one doesn't need to be a "stable genius" to do some basic mathematics. "He talked about a $33 billion that Pakistan received from US. The fact is, since 2001 Pakistan has received somewhere around $4.8 billion under the head of security assistance, and $5.3 billion in the realm of civilian assistance." The former Foreign Minister claimed that "Pakistan has been happily scapegoated for the immense failure in Afghanistan for which Islamabad is an equal victim to Kabul". "We can't afford to be flippant about the realities on the ground in Afghanistan. Warlord-ism all over the place in Afghanistan, where Taliban have taken over," Khar said.Talking about Pakistan's ties with China, she said: "China is a regional strategic partner, perhaps the only real strategic partner we've had... not from today or the past five years but for the last four decades. With them (China), we have complete alignment of interests."